I awoke this morning to the sound of my phone ringing at 7:15am. Who could be calling I wondered in a fog, got up, and picked up the phone to see a 720 number. That's the Denver area, and a second later it hit me this was Tia's old number, and the phone Delaney has. I called right back, but I think he was leaving me a message, and didn't answer. Doh! We never practiced call waiting, and he's never had a cell phone. Should have explained that. I tried calling again, but he'd turned off the phone. Doh! Another thing we should have practiced. Call back in 2 minutes. So I sent him a text, not sure if he'll know how to read it (or get it). I didn't bother with VM since he won't know how to check it. I did listen to his message, and he sounded a little sad, more so than annoyed (that came through too). He said he wanted to hear my voice. I had another message from last night as well. He'd called at 10:15, which was right when my Mom called and asked me to come get Kendall. I walked down to get her, and that 5 minute stretch was when Delaney called. Now I feel I'm letting him down slightly. I almost think I should go down there tonight and have dinner with him, let him know things are OK. I might do that after the zoo. Today is the first day that I've really had any significant time on the computer over vacation. That probably sounds like it should be the rule, and it does tend to be, but this is the first time in a long time that I've let go of SQLServerCentral for a week and allowed others to be responsible for editorials, scheduling newsletters, everything! Typically I've done some work beforehand to be prepared. Being busy with my nephews and family has kept me going, and it's been great wandering around the northern DC/southern Maryland area. I've had the chance to catch up with my brother, Mom, and other family. Only with my son being gone to a leadership conference, and my daughter sleeping in, do I have time to write a little bit. And I've missed it. Not the work, but the writing. Perhaps I'm more done as a technology guy than I realized. Delaney is definitely better today, but still sick. He was tired last night after we hung out with the cousins and let the kids play together. He feel asleep on the way to the hotel, and then he was tired this morning, so I got up to run, went to get coffee, even then went to breakfast with the cousins and Grandma while he slept. Afterwards he said he would get up with us and even swim, so we're heading to the pool soon, hopefully he's OK.
We went to drop him off last night, but apparently we had the dates wrong. It's today that he gets dropped off. At first I was annoyed, but the paperwork they have shows the 29th. He didn't miss anything, which was good, and so he was happy to come back, see the cousins more, and relax again. He'd definitely nervous about being alone for a week, but I said I'd come see him if he wanted. So we'll drop him off later today. 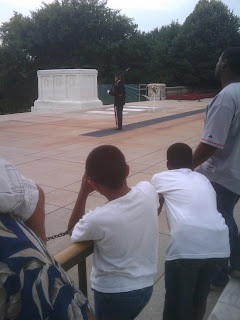 One of the things Delaney wanted to see before he went to the leadership conference was the Tomb of the Unknown Soldier in Arlington. I'd talked about it, saying that I remembered it from when I saw the changing of the guard in high school, and I think it excited him. It was definitely one of those moments, perhaps because I was with a veteran during my Presidential Workshop week, that stands out in my mind. 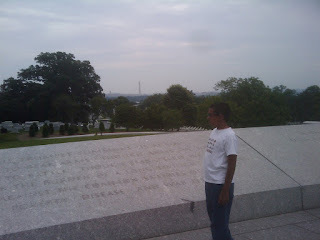 So we headed out early yesterday: Delaney, my brother Jim, nephew Ravi, and I down to Arlington. We got there, and started walking in, both kids excited. As we walked around, all the headstones and plaques set into the ground dampened the mood a little. I think it stood out for Delaney just how solemn it is, and how terrible war can be. 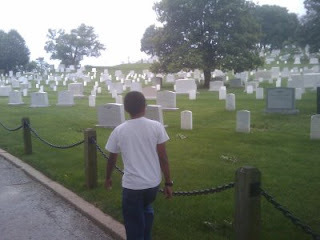 He kept stopping to read headstones and markers, and I think that stood out for him. We arrived at the Tomb of the Unknown Soldier, just as they were starting the ceremony, and we watched them change the guard, and then two wreath changing ceremonies with local schools that were providing the wreath. It was kind of amazing. Delaney liked it, but said it was sad to many people had died. One of the things that I've meant to do for years, but never have, is visit a grave. 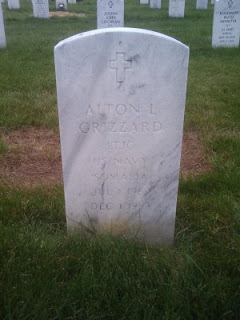 Alton Lee Grizzard, a friend I knew after college, shared beers with, had over to my house, and attended his Navy SEAL graduation, was killed in 1993. I attended his funeral at the Naval Academy, and tried to help comfort his family a bit afterwards. I'd never visited him in Arlington, and I got to yesterday. We arrived today, actually, not getting to our hotel until 12:30 this morning, Eastern Time. It was one thing after another, a slow flight, slow baggage unload, an extremely slow Dollar rent-a-car line, and then one wrong turn on 695. The flight was OK, despite Kendall not having her DS, and my laptop batter dying 2/3 of the way through her movie. She put up with it well, listened to some music, snagged my iTouch for games, and played with her stuffed animals. I guess I can't complain about her bringing 4 of them since the 2 on the plane kept her occupied for awhile. After landing, I had the rude surprise of there being no rental cars at BWI. I specifically picked Dollar as they were one of the companies that said a counter in terminal. After the delays of getting to Enterprise off site in Seattle and Pensacola, I was hoping for a smoother trip. Instead we stood at the curb, waiting 10-15 minutes for a shuttle in the humid Maryland night. It wouldn't have been so bad, except a police car was in the next section over and kept running his siren every minute or so. He was clearing cars that were waiting at the curb, where it's a no waiting zone, just a pickup zone. I get that the police wanted to keep the lanes moving, but it was silly to run the siren. I mean they would get behind a car, and run the siren. That car would take the hint after 10 very loud seconds of siren (or 20) and move on. Then the police car would move 15ft to the next car and repeat. There were two cops, and I saw one get out of the car periodically. One could have just walked the 15 ft and knocked on the window, but apparently that is too much effort. Instead they had to blast everyone's eardrums in the area. Kendall complained constantly about it, and I agreed with her. By the time the shuttle arrived, there were a lot of people. As keeping with the last few months of one thing going well while another goes wrong, the bus stopped literally right in front of us, so we got on and had a long crowded ride to the offsite rental place. It wasn't horrible since every car company was there, from Hertz to Enterprise. I thought that we would have more luck as we were off quickly and 3rd in line with Dollar. I saw about 20 people in line at Budget. However it wasn't to be. Why does a rental car company have to take 10 minute to process a rental? I mean they have all my information, they could easily have me decide on fuel and everything else beforehand. It's dumb these days to try to stupid upsell as many people travel regularly. My time didn't take too long, but the first genius in line must have had something going on. It look almost 20 minutes to rent him a car, and with 2 people renting, it was slow going. We finally got our Caliber, and Delaney gave me a "whoah, crank windows" when we got in. Once again, I'm amazed, and we had crank windows and manual doors. I gave Delaney directions and we headed out. He tried to read to me, but the directions didn't quite match with what I saw. We ended up turning the wrong way on 695, and then not having an exit to take for like 6 miles. So we turned around, arriving at our Extended Stay America at around 12:30. As a low budget place, they close the office at 11. So we had to call the national number, they called and woke up the clerk, who wasn't happy to see us. She wasn't a native US English speaker, didn't want to open the desk gate, sliding forms under for me to sign. We had a semi-effective communication exchange where I didn't get an Internet code (and didn't realize it until I woke up), got a smoking room (I had reserved non-smoking), and got a 3rd floor room when I asked for bottom floor. There is no health club, despite the note listed in the reservation. I'm not sure if Expedia messed up or Extended Stay, but my money's on the latter. Expedia has served me well for years, even impressed me at times. In any case, I woke up, not well rested thanks to the thin walls and group of people that decided to keep music just loud enough to annoy until after 1:30am. The kids were sleeping in, which was fine with me. I made arrangements to switch rooms later, learned about the health club, got an Internet code, and went running down the road. By the time I'd changed and was ready, the kids were awake, so we walked down to see Grandma Mary, my Mom staying in the same hotel. The kids stayed there, I did my 1.5mi and then showered. Then it was off to see the cousins! We haven't seen them in 2 years, when they were 4, 2, and 2, so this was a surprise. They were shy, at least the 4 year old twins were, but didn't run and hide. Five year old Ravi took to Delaney right away, sticking close by to his new role model. It was really great to sit and chat with my brother and sister-in-law, letting the kids play legos and other games around the house. Kendall showed off her stuffed tiger, and got one of the twins to show his dog. Delaney built things, and one of the twins had a "dollar store" in the upstairs hallway, selling pencils and other goodies. Later on Kendall ended up buying a small fabric blanket for one of her animals. After a home cooked breakfast, more food than I've cooked in 2 weeks, we decided to head to the inner Harbor in Baltimore. We got down there, thinking we'd hit the aquarium, but it had a huge wait, not conducive to 4 year olds. Instead we took a tour of a submarine anchored there, and then chilled in Barnes and Nobles to avoid the June heat. After a nice dinner at Don Pablos, we then headed back to the house, and introduced the cousins to Bolt. They thoroughly enjoyed it, repeating lines afterwards with Kendall. Delaney was a little sick all day, a chest cold with lots of coughing, so I loaded up on Nyquil and Dayquil for him to take to the conference. Now I'm ready to call it a day and get up early to take Delaney to the Tomb of the Unknown Soldier. Labels: Delaney, Kendall, Steve, vacation, Washington D.C.
Well, slowly my new desktop is getting set up. I wanted to do more virtually, but I’ve had issues there, so I’m keeping things organized and slowly getting things set up. It’s good to be back at my desk, though I feel pressure to get a bunch done quickly. Leaving at 3 today and we need to pack. I recently attended SQL Saturday #14 in Pensacola and took my daughter along. This was the third presentation she's come with me for, and it worked out OK. She sat up front and flipped slides for me as I'd forgotten my clicker on the trip. However it wasn't perfect. At the speaker's dinner she put up with Andy, Brian, Tim Mitchell, and Devon Knight out at dinner. She wasn't happy, but she did it without complaining. The same thing happened at the after party, and she let me stay longer than we'd agreed on, mostly thanks to Ms. Jessica Moss entertaining her a bit. I owe Jessica a drink for that! I've been invited to a few more events this year, and I have PASS and SQL Connections scheduled as well, but I won't be bringing anyone this year. Last year I brought my son early to PASS and then he flew home alone, but I've got too much travel scheduled, and don't want to be gone longer than necessary. My wife and I have brought out families along with us on trips, usually with a relative or the other of us along to keep them occupied. There are times that it works out and times it doesn't, but it's allowed our kids to see a lot of the country, way more than I ever saw before I turned 18. The kids get into podcasts at times as well, though not as much as they'd like. It takes time to get them in sometimes, and the daily grind doesn't allow it. Most of the times the kids are pretty understanding that Mom and Dad work at home, and we appreciate that. Both of us being Type A means that we work a lot, and that impacts the kids at times, but we try to make it up to them, and use our flexible schedules to our advantage. I go to lunch with kids sometimes, spend time with them when they get back from school, go on most field trips, etc. They even play hooky with me some days and go up to the mountains to ski! It's not always appropriate to integrate kids into your work, but when you can, it's a great lesson for them to see their parents working hard and earning a living. Or he sounds better. Delaney is up and shooting things on the XBOX with Kendall. I can hear him cheering as they make their way through Lego Star Wars. He slept almost all day, getting up around 4 and having some water, and then trying some food. He kept things down, and when I came in from cutting grass he was in his flight suit, watching TV and looking for food. Good to see since we need to get ready for our trip. It's been two and a half years with the tractor, and I just crossed 100 hours on the engine. That has been a good investment, and it's worked out well. We spent over 30 hours that first year clearing snow, then 20 more cutting grass with the help of the lawn tractor. The last two winters almost no snow to move, but a bit of grass cutting in the summer. I went out to do my 30 minutes today, but that put me about 20 minutes from 100 hours, and in trying to beat the rain I decided to just go for it. Delaney said he threw up in this morning and then went to lay in our bed and slept. I woke him up at 11 when I was getting ready to leave for lunch and he seemed better, said he'd be getting up. However when I returned, he's back asleep in our bed. Doesn't look good, and hopefully he'll be better tomorrow for our trip. Our connection bouncing around all day. Seems OK now, we'll see. Our router has been connecting and disconnecting since we got home last night. I walked over to the barn after karate to say hi to Tia and the kids came running outside, telling me the Internet was broken and I needed to fix it. I checked, reset the router, and found it would connect, then disconnect after a few minutes. The cycle repeats, and while I managed to get a few pages to load, it's not any way to work. This morning the same thing was happening. I found Tia in bed with her laptop, saying that things weren't working. I asked her if she'd reset the router again, and she said she would have, but was involved in an intense game of Spider Solitaire, and would go down shortly. I called Qwest after resetting things, and their automated system told me there was an issue, they were working on it, and no time estimate. I can see the other side, but it's very frustrating for them not to provide more information. Tia said that it was a good system, they'd informed us and we didn't have to spend time talking to an agent or going through troubleshooting. I know she's right, but it's frustrating to not have things working. And it's annoying to not know how long things will be down. I came upstairs, thinking I could write a bit since our Internet is down, and found Delaney in our bed. I went to get him up, and he said that he had thrown up, and had a headache. Not looking to be a good day with him right now. Hopefully it's just a food thing and not an illness. It's late, it's been a busy day, so why bother to spend 10 or 15 minutes at night jotting things down? For me there are a few reasons, but the main one is that it's cathartic. I can unwind a little, let go of things, and sometimes think more clearly. When I was doing more authoring, a little writing after work helped to cement some ideas in my head, and many times gave me something to ponder or work on overnight or throughout the next day. Taking a few minutes to write usually just makes me feel better, and better understand what's happened in my day. Tonight we took Delaney to get his eyes checked. He'd said that his glasses weren't working great, though I was thinking it was because he rarely cleans them and they have fingerprints all over the glass. However seeing him flip them upside down sometimes to see better had me worried. So he headed down to Dr. Vaske tonight and had things checked. His eyes were slightly worse, down to 20/30 corrected, so they're not horrible, but the Dr. said that his growth spurt over the winter probably altered his prescription. So I asked him about contacts and he said that it was borderline with Delaney. He was right at the age they consider it, if he has good habits and can keep his hands clean. And he doesn't freak out with something in his eyes. I said we should try, going with some daily wear lenses, so Dr. Vaske took him into the exam room and checked things and then put one in Delaney's eye. You could see him freaking out a bit, scrunching his eyes, fists tight, worried. After a couple tries it went in, and Delaney didn't even know it. We were looking at him and he asked if it was in. It was, and we had to caution him not to run his eyes, but he said it felt fine then, still a little freaked out (his words) from the experience. Getting it out had him likewise a little nervous, but he managed and said it wasn't horrible. They didn't have time to go over the insertion with him, so we'll do that tomorrow, let him wear them Fri and then take a break in DC. I'll help him the following week and he'll have a followup. If it goes well, he might be on to daily wear lenses. I didn't expect the week to fly by this fast, but it is. Between the crazy weekday schedule with kid events, Tia being busy, and me trying to keep on top of the grass, I've lost significant time by trying to also get my new machine going. It's been an experience that has had me with W2K8 R2, Win 7, Win2K8 SP2, and Win 7 again. I think I've settled on Win 7 and will work through issues as I find them. Worst case I'll do without 64bit guest machines and live with Virtual PC for now. I'd like to get Virtual Box going, but twice the install has blue screened and I'm guessing it's a USB or LAN driver, but I don't have time to mess with it. It's Wed and I haven't worked on Database Weekly all week and it needs to be done before I leave Fri. So I'm at the Douglas County Parker library, working a bit while Kendall is tutoring. We found out the parent of one of the other Boy Scouts cleans houses at camp last week, and since we haven't been thrilled with our maid service, we decided to give her a try. She came by to look at things today, and I walked her around, feeling like the blind man trying to describe the elephant as she asked me questions about what I wanted done and which supplies we have. While I can, and have cleaned my house before, I'm somewhat ignorant about exactly how I should tell someone else to do it, especially with a wife. Tia was busy, so I made do and scheduled a first cleaning in a week. We'll see how it goes, and Delaney gets a bonus. His scout friend comes over as well. I went to add a few things to the new Windows 7 desktop today, and of course I have installer issues. I'm trying a few things, and need to post what works. I did solve my screen saver issue. Apparently lots of USB mice and keyboards don't allow the screen saver to activate, which was my issue. I downloaded updated drivers for 64-bit for my Microsoft Wireless Laser Mouse 5000 and it's now working. Tiffany and Trixie, our new guinea pigs are settling in to their new house. We built them a nice cage in Kendall's room and they're not freaking out when we come into the room or look in the cage. Kendall's still thrilled as well, bringing them out here and there. I was working in bed this morning and she walked up with Tiffany, asking if she felt greasy. I think Kendall wanted to know if they needed baths. Yesterday I found Trixie on Tia's lap at her desk, apparently Kendall wanting to be sure Trixie gets to know the family. I still need to find straps and secure the cage to the wall to be sure it won't come down, and I'll look for something today when we go to town. I packed the kids up, after doing 30 minutes of cutting grass, and then shooting 3 podcasts outside in the cloudy weather. We drove to Southlands to get my credit card. I'd left it at the restaurant on Sunday, and needed to pick it up. As we drove, it started raining. It was really coming down when we got there, and I ended up going in alone to get it. Kendall almost always comes with me, but it was raining too hard. I got it and we headed West. The restaurant is North of our house, and we needed to go to Blockbuster, which is East, so we were making a big rectangle to get there. As we got into Aurora, it stopped raining, and the roads were even pretty dry. However we turned South to go into Parker and it started up again, hard hail leaving quarter sized hail on the truck. We got to Blockbuster, and raced in, Kendall commenting how it was raining "so hard!" It actually rained, lightening, and thundered so hard the Blockbuster computers died. Next we stopped to grab food, but it was so flooded in places, almost a foot a few times, and still coming down. We made it, but I declined to hit the grocery store. Tia was down in Castle Rock, and it was clear down there, so I called her and asked her to stop. By the time we'd driven 7 miles toward home, the rain had stopped, and it was barely wet at the house, no puddles anywhere. And we could have used the rain! It's not often that I wake up feeling dizzy, and I didn't at first this morning. I lay in bed, working on the laptop for 30 minutes or so before heading downstairs. The plan was to work on my machine, get things set up, and transition stuff to the new box. However as I started to work on it, I felt dizzy, blurry vision, a sign of low blood sugar. I looked for peanut butter, but we didn't have any, so I ended up drinking a big glass of orange juice and going to bed for an hour or so. I felt much better when I woke up, but I certainly didn't need the lost time at work. I still love my G1, and I got a pleasant surprise recently. I was out at dinner with my wife, and we needed to look something up. So we decided to race, her with her Blackberry Curve (and Verizon), me with my Tmobile G1. The kids were excited, and so I turned it on and saw a note about an update. I clicked "OK", not really thinking about it since I get these messages all the time from apps I have installed on there. Just as my finger was pressing the screen, I read "Android" in the message and couldn't stop myself. I hate OS updates, especially when I'm trying to do something else. So I sat there, waiting about 10 minutes while it downloaded the update and then restarted my phone. It applied the update as well, so the restart was about 5 minutes more. There were some cool images on the phone as it applied the updates, so at least there was something to look at. The update finished, I popped a browser, looked up my item (losing horribly in the race) and went on with my evening. The next day, I was riding in the car with Kendall next to me, and I got a message from someone. Normally when I respond, I pop open the keyboard and type my response. This time, I clicked the screen to highlight the text box and was about to open the keyboard when a virtual keyboard popped on screen. That was cool. I'd never seen it, and with Kendall leaning on my arm, I didn't have to move. I one thumbed a message out, making a few mistakes, but not many, and sent it. All without opening the phone. Since then there are a few times when I've used the virtual keyboard, since it's easy to do, works well, and provides feedback about which item you've pressed. It's not quit as quick as the physical keyboard, but it works well one handed and I don't have to open the screen. The other interesting thing I noticed was during a phone call. Where I live the voice mail system never connects automatically. When I call, it assumes I need to leave a message and I have to his ***, then enter my phone number and password. However the interaction between the ***, the message to enter a phone number, and then the message for the password, is slow. You can't jump the gun and you have to wait. However when I wait, my phone always goes dark and I have to hit the menu button to bring the virtual dialpad back up to make the entries (or open the device). This time, I hit *** and then listened for the system. When it responded I was set to hit "Menu", but all of a sudden noticed a padlock icon on the screen with a "double tap to unlock" message on it. A quick double tap and I was entering info again. It doesn't sound like much, but it's a much easier, and simpler way to handle this, and it really made me appreciate the OS. Little things like that are why I really like Android and this phone. I'm not sure I'd always want to be stuck with the virtual keyboard, but it's nice to have that option. Delaney wanted to do the class with me tonight, so we dropped Kendall off at piano and then headed back together to karate. We had a good class, small with only 11 adults and Delaney. After a good warmup and kata, we did a bunch of partner drills, rotating around. I kept missing Delaney, but he seemed to enjoy it. He prefers the adult class more and more, which is neat. My ankle was sore, messing me up on balance a few times. When we worked on kata, I'm glad we did it in two groups, taking a break so that it could rest. I did OK in partner drills, but it was definitely sore later. It's a good thing I get 3 weeks off from baseball to let it heal. Running on it every week in cleats is slowing the healing. I had some issues with Windows 7 and a piece of software. Nothing big, but it reminded me that this is beta software, and I'm not sure the host OS on my new desktop should be beta software. I'd started with Windows 2008 R2, but forgot the password, and moved to Windows 7. Now after a few issues, I've decided that it makes more sense to have a stable OS for the base. So I'm downloading Windows 2008 with SP2 slipstreamed in there from Microsoft. This should give me a supported, stable OS for the lifetime of the machine, the next 4-5 years, and with both Hyper-V and Virtual Box running on the machine I ought to be able to test things and keep a stable environment. My first thought is to get a Windows 7 guest on Virtual Box and use that as my primary desktop with mail, browsing, and iTunes. Beyond that I'll have see what comes up. Definitely I'll need a couple VMs as well for SQL Server instances. I was going to do 30 minutes of cutting, but when I hit 30 minutes, I had maybe 10 minutes of cutting in the NE pasture, so I finished. Then I pulled the tractor out of there through the gates andwas driving it to the garage when I saw some really tall, 3ft, weeds in the backyard. So I spent a few extra minutes running in a few circles and knocking them down, including a lap around the arena. The back is a mess, and it makes me a little crazy to see that. As much as I don't worry about an immaculate yard, I hate to see one out of control as well. I know that today for sure. I didn't have a great day at baseball, but it was fun. I had a smile on my face most of the day, joked with our guys and the other team, and just had fun. We were paying a bit of a hodge-podge team, a few new players, and a slow pitcher. So we expected to jump on them. We did, getting a few people on base, but we ended up hitting out to people and not scoring in the first. We shut them down, me in center, and that was good. They blooper two into center that were short, and one was a single. The other, however, was dropping fast, and while I couldn't get it, everyone thought I might. So when it dropped, I snagged it on one hop, and then threw to second for the force out. After that things went downhill. I hit 2 hard flies into right, one with a friend's 33" bat (mine is 32") and it was deep at the warning track. The guy dropped it, and I got a single. It would have been a double, but the people in front of me had slowed down (2), and I wasn't sure they'd make it to third, so I stopped. My next time up was a hard grounder to first that the guy got lucky and snagged, and the next time was a strikeout, but I think it was a bad call. A few other people, including a teammate at second couldn't believe that was the call. I was two steps to first when it was called, and I'm sure I never could have reached it. Oh well. I walked in the last inning to lead off, us down 3, and managed to get around for a score. I actually ran for a guy, and then came up again, with 2 outs and a man on second. I worked a full count, getting a silly knuckleball that I should have hit. It was up high, almost softball-like, and I started laughing. It dropped in, and I should have hit it, but it was just funny to me. I fouled off a few more, he threw me a similar pitch that might have dropped low, but I swung and missed. It was a good laugh, but I ended up 0-5 with a walk. In the field I caught a short pop-up in center, which was good. All the balls during practice had looked deep, but hadn't carried, so I was ready. I was playing one of their strong hitters shaded to left center and he hit one to right center, short, and I was running over there hard. I just missed it, diving forward, and rolled coming up and chasing the ball. I threw it in and we got the guy at third. However 2 more steps to the left and I'd have gotten it easy. Earlier there was a hit to left center I chased, and ran it down on the ground, but it got me moving more to the right. The last couple innings I was in left, and in the bottom of the last inning, us up 1, I was deep in left. A hard hit to me, I turned and ran, and got to the fence just in time to see it go over. I wish I'd jumped and hit the fence, though it would have been for show. No chance of catching it. We lost, but it was fun, even though I wasn't thrilled with my performance. I tried hard, and didn't get (more) hurt. I was hoping for 30 minutes of grass cutting after baseball, got out there right away when I saw Tia on the trail, and started mowing. I figured I'd quit when she got home. She wasn't around at 30, and I was almost through a section of weeds, so I decided to get 45 minutes done, knowing that I needed to do a podcast for work. I hit 40 minutes, no sign of Tia, but I saw Delaney run out to the field where I was mowing. I stopped, and he said Tia had called, needing me to bring her some bug spray. Apparently the mosquitos were crazy, and I could believe it. I'd been bitten a few times, so I stopped and took her the spray. 41 minutes done, my guess is I got an acre cut, but there's more to get done in the middle of the track. I'd like to finish tomorrow, but I'll check on weather before I decide. Before Kendall comes home, we decided to clean her room, and remove traces of the mess. I cleaned up the floor with the Shop-Vac and Tia took over the deep cleaning and replacing of toys. My job was Delaney's room and I went in there with him, going through his shelves, toy buckets, and closet, throwing out trash, picking some things to give away and then moving a few things into the basement. After we got done, his room actually looks pretty good, and Kendall's looks great. So now the plan is to get Kendall, and some supplies for building her a better cage. I'm slightly worried about making something strong enough to repel dogs, so I doubt we'll get it done today, but we'll get started. I think I got about 3 acres cut this morning. Feeling motivated by gray skies threatening rain, I decided to get out and do some cutting. I didn't get my 30 minutes in yesterday, so I headed to the gas station first thing to get some diesel and then jumped right on the tractor, knocking out about 65 minutes, and getting a good slice of the NE pasture cut. Not sure if I can finish it in an hour tomorrow, but I'm thinking to try. I do need to see if I can bend a few pieces of metal back on the bush hog, or even replace them. My wheel is dragging badly and the thing keeps loosening up. Not a huge one, at least not for most of the family, but this will be a heartbreaker for Kendall. Tia told me she thought Kendall would remember this for the rest of her life. Last night Kendall went off with her Aunt to the zoo, or was supposed to. I came home, by myself, cut some grass, and was about to head out the door to pick up Tia's prescription before she came home. I knew she'd want it, and Kendall called as I was starting to drive away. She wanted to stay the night and asked if I'd bring her some clothes. I was about to say no since they live way up North, but I remembered Kyle was going that way later, so I said I'd drop off a bag with him. and stopped. Her room was a mess, and I registered the guinea pig box and cage on the floor as I saw Oscar race out between my legs. I couldn't believe it and my brain kind of locked up. I took a step in and saw Roybis, the guinea pig she'd just adopted two days ago from the shelter lying on the floor. I touched him, and sure enough, he was dead. I looked for Buddy, and didn't see him. She's had him since her birthday, and is so attached. She even took him with us this week when we went down to Scout camp. I frantically searched through the debris, looked under her bed, in the closet, all around. I held out hope that Buddy had hidden himself and survived. Actually I still do since I didn't find him or a body, or blood anywhere in Kendall's room. I had to leave, so I shut the door, ran my errands, and came back. I dreaded doing it, but I went back into Kendall's room last night and started to clean it out. I pulled out toys and stuff she's accumulated, hoping I'd find Buddy, but no luck. Even today, I left some food and water on the floor there and in the bathroom, hoping he'll come out somewhere. Kendall is going to be heartbroken. I know it's not the dog's fault, but I'm still mad at Oscar. He is trouble, as far as I'm concerned, and I wonder if Kendall will ever want to pet him again. She's a tough girl, and it's not like anything hasn't died around here before, but this is different. This was her pet. She's likely going to stay with her Aunt again tonight and we'll get her tomorrow and break the news. I hope she wants another one, and that will help heal her. I'm already thinking that I need to build her a better cage, more sturdy, and I might start on that tomorrow before she comes home. Delaney's been a Scout camp all week, Kendall went over to her aunt's last night, and Kyle left for Phoenix today. A quiet house for a few hours until Tia and I go down to collect Delaney from camp. Kendall wants to stay with her Aunt, and that's fine with us after last night's disaster, which I shall write about soon. A far cry from the days of one of us having all three kids whenever we did anything. Kyle left early this afternoon for Phoenix. He has friends where and wanted to go visit and see a concert. We said it was OK, but he had to fund and plan the trip, which he did. He contacted friends, has a place to stay, a ride from the airport, and he bought the ticket. Tia was going to drive him to the airport, but she got caught up in a call, so we gave him money to park for the weekend, and he left, saying good bye, a bag on his shoulder, walking out the door. Kind of amazing to think of him growing up to the point where he can just drive and head out of town on his own. Hopefully he has a great, safe time. I went down for a lunchtime run on the treadmill, despite the nice weather. I had a DVD I wanted to get through, so that pulled me down. It was a good run, moving steadily through a mile, then slowing a bit as the ankle started to feel sore. Not much pain, but I noticed it, and that was enough to get me to take it easy. I got through the 20 minutes and then walked, feeling good, but wanting to get on to other things in my day. I actually feel like I can run on Sunday when baseball comes around. I wanted to spent 30 minutes a day working on the property somewhere. Mostly that's cutting grass now, and I kind of made a small promise to myself that after my trip two weeks ago I'd do that. I did a little when I got back, but then the rains came, and I got away from it. I said a couple times this week that I should get out there, but with Tia being gone and a few trips out to Elbert, I didn't have time. Well, tonight I did, so I got out there after work was done and started mowing. I went up and down the driveway a couple times, and went outside the gate since those areas were really ragged, but I didn't get as much cut as I'd like. I really need to use the smaller mower or the weed whacker. I did manage to bend the back wheel on the bush hog, or at least the frame, so there's another nice repair I need to get to at some point. In the meantime I did manage to get the bush hog into the center of the track and start cutting. I spent about an hour and got some good cutting, and I hope I get another hour or two before the rains come tomorrow or Sat. I took Khali in to the vet today. She really had problems with her right front shoulder the other day, so much so that she wouldn't put weight on it and yelped if you touched it. She even growled at Deuce when he tried to play with her. She's been getting better all week, but Tia and I were still worried. I finally had some time today and took her up there. As usual she didn't want to get out of the truck. Actually she couldn't get in, and didn't want to. I tried to lift her, but she was too heavy, and I was scared to grip her too hard. I finally got her to put her front paws up and I could lift her in. When we got to the vet, she ignored me as I opened doors. The whole way over there she'd had her head out the window, jowels flapping, which made Kendall laugh. When we pull in the parking lot, she lies down in the middle of the car and goes deaf, ignoring me calling and tugging on her. A bunch of kids saw us pull in and they were standing nearby hoping to pet Khali when she came out. Kendall was talking to them, telling them about Khali, and finally after about 5 minutes of cajoling she came partially out and I lifted her down. Kendall put the leash on her and wanted to walk her in, but I stayed close, and after a few times of me grabbing her, Kendall gave me the leash, and we went in. We saw a new vet, a younger lady that had recently started. She said that she wasn't sure what was wrong with Khali, maybe arthritis, maybe cancer, but she suggested that we wait a few weeks and see how Khali does. She gave me a few different drugs to try and see if they help. Khali was really shaking when we were in there, but I couldn't tell if it was because we were at the vet (and she hates the vet), or because she was hurting. When my sister-in-law showed up, she was so excited, thinking she was leaving, and appeared to be better, but it's hard to tell. So we'll try new drugs and see what happens. I felt fine when I was running, but at karate my ankle felt sore, so I was slow. Not a big deal, new stuff, everyone moving slow, I just worked on technique and not speed. Ended up with a little sweat. With the weather warming up, and me being worried about the Prius being stuck in the road at the Scout camp, today was a good day to head out there. I had a productive morning, and thought I could get down there and back quickly after picking up Kendall. I'd forgotten my phone when I left, so Kendall and I came back, I checked work, and she grabbed Buddy, and we headed out to Elbert. It was a nice drive, and I enjoyed the time with Kendall. We talked and joked a bit with each other, and passed the time. We got down there and drove out to the campsite for our boys. And found the road blocked. Well, not really blocked. There was a piece of twine tied across the entrance to the wooded area. I decided to walk down and see the road before driving and let the leaders know we were there. We didn't see anyone, so I got in the Prius and tried to drive it out. I couldn't back up at all, but I had some forward movement. I rocked it a little and managed to get about 15ft down the road, but couldn't get out of the ditch on the left side. I gave up, and Kendall said I'd gotten it "more stuck." We came back and I untied the twine so I could drive down. Kendall was worried that we were breaking rules, and I wonder how long that will last. I reassured her and we headed down in Tia's truck. I hooked up the tow line to the back of the Prius and Kendall stretched it while I drove the truck closer. Then I hooked it on the front and pulled the Prius back. It was slow going, mostly because I didn't want to jerk anything, break the tow line, or have any mishaps. Eventually it was out enough that I could drive the Prius, so we parked the truck, I moved the Prius to the lot, and Kendall and I headed home. I was going to take Kyle, but he wasn't around and I wasn't sure how long it would take. Plus I know he'd be annoyed if I took up his whole afternoon and we couldn't get it out. We don't need the car until Friday, and we have to go back then anyway, so we'll get it then. This way I'm also not worried about blocking anyone in that wants to leave before we get down there. Buddy wasn't overly impressed, but he survived the journey, and Kendall was thrilled to bring him. We didn't see Delaney as the boys were out when we got there and then he was at his Railroading class. I saw his tent-mate, but he wasn't sure where Delaney was, so we just headed home. We had to come to Parker for an orthodontist appointment for Kendall. Yes, another one, this one I scheduled today. She'd lost a build up on her molars in Pensacola and I'd been delaying calling for, well, no reason. Mostly because I kept forgetting. I remembered today as we drove out to the Scout camp to rescue the Prius, and called. They didn't have anything good tomorrow, and so I took this one. So I was jammed up for work, and still am. I'll be working tonight more, but at least I could bring my laptop and work a little. The picture above is Kendall and me, sitting outside the Parker library after her appointment. 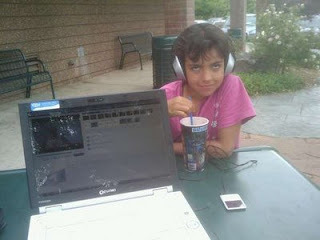 She's listening to her iPod and finishing a slurpee while I'm trying to work on the laptop. Summertime, not too hot, a nice breeze, a laptop and wi-fi from the library, and I'm set. Life is good. 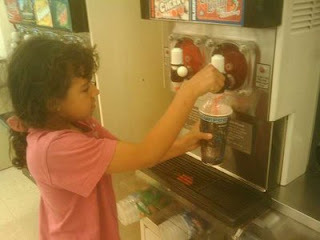 I snapped another one of her loading up at 7-11 as well. It reminded me of summertime during my childhood. I’ve been wanting to get all my run data in one place, and MapMyRun seems like the best place for that right now. Nike+ doesn’t allow me to enter runs, of which I have over a 100 before I got the sensor, so that’s out and a spreadsheet isn’t fun, or online. So I’ve tried to enter a few here and there, but it’s mind numbing work. So today, while on a conference call that doesn’t always have a lot of input from me, I decided to cut and paste from the blog over to mapmyrun.com. I’d gotten all of 2009 done recently, rounding out Jan and today I managed to get down to Dec 11, 2008. That’s day 93, and it’s a good portion of my streak. I have 4 or 5 in there already from earlier days, but I’ll keep working and try to get them all in there before I hit one year. I wanted to run before my 10:00 call. It was 9:30, but with the treadmill and no need to shower before my 10:00, I went for it. I went slow, 5.7mph, and the ankle felt OK for about 10 minutes, then it was slightly sore, but not much. Star Trek kept me interested and I just ran to 18 minutes, walking the last 2. Couldn't sleep, finally up at 6:45 when I got up to relieve myself. Decided to stop tossing and turning and just start the day. "Hey honey, I'm not going to make it. Can you check for flights tomorrow morning?" My wife was calling from town. She'd taken my daughter to get a second guinea pig (want to be sure he has company) and was running late. This was 4:30 and she had a 7:10 flight to Atlanta. With traffic on the way back, it wasn't looking good to get home, throw a bag together, and then drive to DIA. It's about 45 min from here, not a quick trip. I checked United, with a very slow Internet connection here today, and found the earliest connecting flights didn't land until 4:41pm tomorrow. Only one direct flight was available, the one she's on tonight. 7:10, arriving at 12 midnight. That didn't seem good, especially as this is a quick trip to the client site, returning Thursday afternoon. That didn't seem good, so she asked if I'd drive her. Not having to park and walk can save 20 minutes in Denver, so I agreed, and got up to get things ready to turn around. A few minutes later I got another call. "I'm not going to make it. Can you pack my bag and meet me?" Not sure what to say there. Me packing for a woman's business trip? For me, no problem, a couple pairs of jeans and polos, even t-shirts would work for me. Worst case I'd buy running shoes on the road. But a woman? Even my wife? I didn't want to, but didn't really have a choice. So I said sure and she directed me. "Grab the laptop and power cord and check for the Blackberry USB cable" Piece of cake, I can do this. MY confidence is growing as I grab the laptop, drop it in the bag and add the power cord. I couldn't find the Blackberry cable where she said it was. Not in the front pocket, not near the bed, confidence ebbing....a litle searching finds it in another pocket. "It's the one with "up" written on the mini-USB connector, right?" She didn't want to check a bag, so I moved her laptop bag near the door. Maybe I can do this? "Now go get the green suitcase from near the pantry." I go downstairs; it's not there. Hmmm, I ask Tia and find it in the laundry room nearby. No big deal, bring it upstairs. "Grab my running shoes and pink t-shirt and socks and set them aside." No problem, I do that, moving them to the laptop bag. It's a big one, rolling, with the 3 or 4 pockets in it. But I'm not sure how to get running shoes in it. She's still talking. "OK, now there are a bunch of dirty clothes in there, pull them out and see what's left." Yeah, right. Figure out what's clean and what's not? Sorry, everything's out. I grab a clean pair of socks and pile them on the laptop bag. "Now go in the closet. Find the pair of black dress pants hanging on the closet rod and pack them." Hmmm, now it's getting hard. Dress pants to me are, well, any pants that aren't jeans. I think I have them, so I move them and I'm trying to figure out how to pack these in the laptop bag with running shoes. I can't, so I ask. "How do I get your running shoes in the laptop bag?" "What?" Silence for about 20 sec. "You don't. Put them back in the green suitcase." Duh, mental head slap. To me, the novice traveler, I take one bag on the plane, always. Never two. If I have two, I check one. "That's day one." Day one? There's more? Yep, there's more. I'm directed back to the closet to find a "linen" skirt, not sure still if I have that right. I guess I'll hear about that tomorrow night if I was wrong. I have to find a "sheer" top and then a white tank-like top with stringy things on it. Men never buy stringy things, so I'm very confused, and nervous. I end up grabbing a few extra tops that have stringy like things on them just to be safe. I figure she's not going to exceed 50lbs in this carry on, so better safe. "Now, go back downstairs and get my prescription." I ran today, and apparently am getting more exercise. Find that, and come upstairs. "Now go in the bathroom and add my vitamins. " Add? I'm confused. Apparently she means open the prescription bottle and move some vitamins into the prescription bottle. Two kinds, she has a routine, I move them, then we're packed. "Now look at the pile of stuff from my trip." Can she hear me opening doors on the phone? She's referring to her last trip, a week in Pagosa Springs for horse training. There's a pile of 2 or 3 bags in the garage that haven't been emptied since she returned Saturday. We have a busy life, I totally understand. Now I'm digging through these bags to find make-up and toothpaste, etc. I move those over, then get told to separate out a bag of "airline" safe stuff that needs to come out. So I open the case, find that ziploc, and move it to the front pocket. "My green brush should be in that pile somewhere." That's not here, it's getting late, I'm running out of patience. I move everything out of the pile, search all the bags, nada. A brush is a brush, right? I know there was some brush in the bag I packed. It's not good enough, so I end up with another trip around, but I can't find it. Hopefully I haven't failed "packing" class. "Now I need my iPod and my ticket." I know where these are. I saw them on her desk, so I retrieve them and drop them in the laptop bag, put everything in the 9-11, and I'm done. Whew! There's 30 minutes that I would not care to repeat. If I had to ask her to pack? "Grab two changes of clothes, my running shoes, my black travel bag, add contact case/solution, shaving cream, razor." I added a new blog to my reader today: The Client Revolution. I heard about this from @NeilDavidson, and he mentioned it was a good example of innovation in the legal industry. Quite a few things I've read on there could be applied to other professional fields, especially software, so it's on my list. A bit of Zicam, making sure I'm getting vitamins, getting some rest last night, I feel much better today. I think the exercise helps as well, heating up the body, killing germs, just overall made me feel better. My throat is very slightly sore, not enough to bother me, but I notice it. I feel like my chest is also slightly tight, but overall I feel about 90% today. And that includes my ankle! After re-twisting it on Sunday, I was surprised that during my lunchtime run it really didn't bother me. I'd love it if that would heal up quickly, though after this week's game, I'll have a three week break. I think nuclear is a part of our energy future, and I’d like to see more plants built. I’m glad some companies are submitting applications for new plants, and I hope we see more. But I’d also like to see simpler, safer, more efficient designs, and this modular design might help. It’s a new Babcock and Wilcox design, that is smaller, only generating 150MW instead of the 1,000 or more MW that many plants develop. However putting these in should dramatically lower construction and operating costs, and you are not necessarily making a $1B bet on a plant, but rather a $10-100mm one. Plus you could spread these out into more places. They’re smaller, so less of a radius around the plant, less of everything, including line losses as you distribute power. As I said, I’m a pro-nuclear guy, so I hope things like this get going. But I don’t want to see us standardize on one design. We need to set a standard for a period of time, say 5 years, but allow people to keep working on improvements and incorporate new designs over time. While scanning news for work, I saw this article on the RIAA and copyright, where a Sony representative said $150k for a song violation is appropriate. To be fair, he acknowledged that the jury picks the awards, and he is asking for a message. This is the McDonalds coffee case in reverse. A message should be sent, but not at $150k per song, or even incident. Ruining a few people's lives won't stop piracy. More reasonable behavior would. I was thinking about this the other day as I heard a song on the radio and thought it would make great bumper music for a collage of images and thoughts. But it would be for work, so it would be for commercial purposes. I'd pay some money for the use of the song, but how much? I've tried to get blanket licenses based on audience, but the RIAA, and other music organizations make it so hard. Thousands for a single song, and tens of thousands for their catalog, despite the fact that I'd be using a small portion, 10-20sec, of a song. On one hand you could look at my audience, and typical downloads, which are about a few thousand a day, so I'd pay maybe $10-30 a day, or call it $0.01 a user. Maybe that's low, and I could pay $0.10 a user per song, but I have no control over that. If I hit a popular topic and ended up with 100,000 views, I'm not sure I should pay $10k. In fact, there's an argument that if I create lots of exposure, and subsequently credit, I'm helping sell and grow the song. Something that the RIAA conveniently leaves out. I'm acting as a radio station, providing them benefits. My thought is that licensing, by the song or catalog, ought to be more reasonable, and fixed, requiring credit or something else that might promote the song. In that way there's a chance that someone will go to iTunes or the Zune marketplace, or even Wal-Mart, and just buy the music. The idea is to sell music, so help people market for you, at a reasonable price. Let them make a YouTube video or parody for $5 and upload it if it's non-commercial. Let podcasters like me buy the rights for $20 an episode, or some regular yearly rate. Despite being gimpy, and having to go slow with a few things, I had a good workout at karate, and worked up a nice sweat. Course that could be because I have a bit of a cold as well. Time to ice and rest a bit. I was working along, trying to decide when a good interval was to call Peaceful Valley Scout Ranch. I knew if there were issues, they'd be working hard, and I didn't want to distract them. I was just thinking at 3:30 of calling when the phone rang. I picked it up and it was one of our Scout leaders who'd been in contact with the facility. All boys safe and accounted for. Very nice to get that call. Apparently there were no issues, and the kids were moved to shelters as a precaution. I purchased a Brother HL-2070 laser printer a few years ago and it worked well for us. It was the first laser printer we had and it allowed us to easily print when we wanted, with no dried out ink cartridges. That's something we have been frustrated with for years. I hooked this up to my computer, and that worked great for a year, until I moved my computer. All of a sudden we needed to put this thing on the network. So I must have configured it to work on our network, but I never assigned it a static IP. As a result whenever our router or the printer rebooted, it would get a new IP. Well, not always, but enough that I used to have 4 or 5 printers on each computer, one for each IP. Last week when I replaced our router, I had my computer on the desk with the printer, and decided to reconfigure it for a static IP. I found this forum post, which was for Linux, but I figured it would work for Windows, and it does. And I didn't even need the USB cable. I connected to the printer from a browser, set a static IP, and it's been working fine for a week like that. Hopefully that will be the end of our printer issues. I hope Delaney is OK. After watching 30 minutes of coverage, I stopped and decided to try and relax. This is a picture from our front porch about an hour ago, looking south, slightly East. That's where Delaney is. Tia noticed it outside, and we took a few pictures, then popped on the news, checking to see. They listed it as SE of Elizabeth, but W of Elbert. Delaney is about 2-3 mi S of Elbert, at the Peaceful Valley scout ranch. I guess our Prius is down there as well. Kendall said she hoped the Prius was OK, I'm more worried about the kid. There aren't any reports of damages, and there's nothing we can do. If it's going to touch down there, we'd be heading right into the path of it. Plus there are tornado sirens that the Sheriff said had been set off. I'm sure the staff down there knows how to handle things and there are lots of shelters on the property with no windows. My guess is merit badges were cancelled this afternoon with kids being locked down for a few hours while things pass. Kind of exciting, kind of scary. Tia said that this was more exciting than the one last year, but I disagree. We saw that one come down from the clouds and touch the ground, kicking up dirt. I felt like Chuck Knoblauch yesterday, with 3 errors, all in one inning. To be fair I wasn't the only one that fell apart, but I definitely cost us a couple runs. The day started out bad when the field changed, and I didn't know it. I got to the field, no one there, and started trying to call around. I reached someone and had to come back to the new field. It wasn't that bad since it was on the way home, but it meant I was there late. The game started slow, both teams having a few 1-2-3, or 4 innings, not many people getting on base. I struck out the first time, turning my head too much and just missing. I got a great curve for the first pitch and fouled it off, and that was the pitch to hit. A bunch more balls on the outside corner, the pitcher throwing fast ones and I fouled a few off, but I kept looking for the curve and missed the last one. I did make a couple routine grounder plays at 2nd, and even backed up about 20ft into right for a pop-up, so things were OK. I popped up a second at-bat and reached on a fielder's choice, and then we broke out. A few hits and I came up with 2 on and drove a nice single down the right field line. I might have made it a double, but my ankle was bothering me, so I'd avoided too much running on offense. We built a comfortable lead into the 7th. Then we fell apart. Pitching woes loaded the bases, then a hit got them 3 runs and a man on 2nd. I then got an easy bouncer to second. I fielded it, didn't bother checking since it was slow, looked at first, and throw. Or tried to. I felt the ball bouncing in my hand, not held cleanly, and I threw it at the ground and it skipped past the first baseman. I regretted switching off first where I'd been for a few innings. Another walk, or maybe the next play there was a sharp one towards first. I went to back up the first baseman or cover, and he booted it. I stopped, or tried to to recover the ball and pulled on the ankle again. Ouch! I then proceeded to in the inning, chase a ball down at 2nd base, a grounder up the middle, and just touched it at the bag, but it got by me. That was a hard play, and it would have been great if I'd stopped the ball. I also got another grounder and over threw first. I think he could have had it with a jump, but it was high, and he was on a bad leg. I did draw a walk on my 4th at bat, so not a bad day, 1-3 with a walk, but we lost 17-14 in an exciting game. It went long, and it was fun, especially with us down 17-8 in the 9th and we got 6 back. I still can't believe I had 3 errors in one inning. Definitely I need to practice more fielding and throwing. Too much time in the outfield. We went out to the Boy Scout camp last night arond 8:30 to drop off a few things for Delaney. He was missing his coat, and good raingear, and we were a little worried about him. So Tia, Kendall, and I drove out there, found the camp, and then got stuck in the mud. 9:00pm, pitch dark, and we were stuck. We'd driven down the dirt road to his camp, and it was slippery, but navigable. Once we saw the leader, and dropped off his stuff, however, we realized we couldn't turn around. A bus had gotten stuck in the mud ahead of us and was blocking the road. We tried to back out, me driving and Tia walking next to the car and navigating, but we reached a place where things got muddy, there was a slight turn, and the car slid into the ditch. Fortunately one of the leaders there lent us his car and we drove home, getting back between 10:30 and 11. We took the car back this morning, with Tia's truck, but it was too slippery to pull the Prius out. In fact, Tia almost got stuck as well, and ended up driving out through a field. So now sure what to do now. Maybe go back tomorrow when it's dried a bit and try, or call AAA tomorrow and meet them there. The entire family is back together, or we're all here. Kyle spent the night at a friends and headed to work, and Tia got home after midnight. We're all here in Parker, however, after being split apart for 8 days. After I reconfigured the router/modem I bought and rebooted it, my son walked in and said his XBOX wouldn’t connect. A quick check of things on my desktop confirmed that my Internet connection was down. A nice red light on the router confirmed that. I double checked the user, password, but the router wouldn’t connect. I had a DSL signal, but not an IP from the WAN side. So with my son urging me on so he could play XBOX live, I called Qwest back and got a new customer service rep. I explained my issue, and she asked if I had a Qwest modem. I said no, mine had died last year, I’d replaced it, and was now replacing the router again. At that point she said she couldn’t help me. Silence for about 30 seconds. I wasn’t even sure what to say. That is truly a way to turn a customer off. However with no choice in the matter, I went on to ask her to check my user/password. She did, they matched, and she said that she couldn’t help since she didn’t know Netgear and they program everything into their Qwest modems. The DSL signal can be PPPoE or PPPoA, but PPPoE is recommended. She would not have mentioned any of these if I had not asked questions. She would have let me hang up the phone and call back for more tech support if I couldn’t figure it out. She at no time initiated information to help me solve the problem or even to move forward. She never told me that I should go to a store and get a Qwest modem if I couldn’t get this to work. She just kept saying they didn’t support non-Qwest products. I can appreciate the fact that they don’t want to support other products. Totally understand the training issue there, but providing settings, like the VCI/VPI settings (she never identified which was 32 and which was 0, I had to experiment), would be nice. Suggesting that I go get a Qwest modem if I had issues, and telling me where to go would have been acceptable. Instead, I wasted almost 10 minutes of my time arguing with her, and Qwest’s time, because she didn’t want to help me. I got a new Netgear DGDN3300 RangeMax Dual Band Wireless-N router on a recommendation from the local geek at Best Buy. It was $149, perhaps a bit expensive, but it was there. He might have recommended it because it was the most expensive one, but he did say the Dynex choice was a POS, and this would work better than the other one they had. I’d read about it online, and it was one that got good reviews, so I grabbed it. I unpacked it, got my credentials and the WEP key from my current router and went to get set up. There are no instructions in the box, just pieces and parts, a warranty card, and a CD. I find that annoying since I can configure the router, and most set up programs are junk, but in this case I gave it a try. I guess I could have just plugged it in and tried a few IP addresses to connect, but I didn’t. All in all, I was amazed how dumb’ed down they made this. Slow for me to get going, and I have some manual configuration to do, like fixing my WEP key, but overall this worked well, smooth, and I’m live. The connection worked initially, but once I started to reconfigure the wireless connection, it stopped working. A call back to Qwest helped me figure it out, no thanks to the CSR. I hear someone moving around. “Where you going?” I ask my daughter. The doppler effect apparently works as an eight year old flies by my office, heading into the laundry room. “You should be drinking water.” I add, doing my diligent parent routine on a summer Friday morning. “I know” comes back as I hear the garage door close, then open again, accompanied by more pitter patter. I walk over to see her with a can if ginger ale by the iMac, watching her “Charlie the Lonesome Couger” movie. We got that recently and she loves it. I think she’s watched it 4 times in two days. That’s kind of cool to me. That soundtrack and narration bring back memories of the Wonderful World of Walt Disney, which I used to watch as a kid on Sunday nights. One of the few times that I got to see a movie on TV when I was a kid. So few of them on. I did manage to get her to drink a glass of orange juice this morning, so it’s not a total loss. Great customer service isn't hard. It's tedious, it's thoughtful, and it's a little effort, but it's not hard. It can cost time and money, and so many people try to shortcut things here, resulting in badwill. In these days of automated voice response and speech recognition systems, it can be frustrating for the customer, and it appears that many companies don't worry about that. I see it as a mistake, and one that small businesses don't want to repeat. They can't afford to churn customers as much as large companies, though large companies are realizing this is an issue as well. I got a new modem/router the other day since my current one has issues. When I got it home, I realized that I didn't have the password to connect to the DSL line, and I couldn't retrieve it from the modem. Not sure why it's a big deal to get it back since that's likely a more secure place than on my desk, but in any case, I can to call Qwest. I got an automated system, as expected, and it wasn’t obvious which options to pick for a “need my password”, but it was simple. I selected “Internet” over “Telephone” and then “Tech Support” since it wasn’t billing or ordering. Next it was “Configuration” over “Installation”, “Email”, and “Troubleshooting”. That immediately brought me to an agent, well not immediately, but within 2 minutes. I got a message in the meantime saying the expected wait was 3 minutes. That’s easy, using automation to efficiently schedule people and providing feedback. I’m not sure how expensive this is for small businesses, but lots of little call center applications exist, and they could easily do this for you. I explained my issue and the agent told me to hold for a minute while he checked. I asked him what he was checking and he said he wanted to verify the old password that he had was working. That’s amazing. I can’t tell you how many times someone has reset or sent me a password without checking it. I’ve done that, and when it doesn’t work, it’s annoying. He then read it to me, let me read it back, and then asked if I wanted him to stay on hold while I switched them. I said no because I wasn’t quite ready here, but I appreciated the offer. Total time about 5 minutes from the phone number lookup to having the info. Very impressive. This month at karate is parent's month, kind of a marketing move by my Shihan. Every Thursday at 7, which is an adult class, but the first one where kids were invited to come as well, he's allowing parents to come in with their kids and train for an hour. I missed last week, but since I got jammed up Monday, I wanted to go last night. I had heard it was crowded, but I was surprised when I got there. This is the first school where we have "spots" in which to line up. Every other school has depended on people just lining up in an order, and maintaining that order. Here the mats have little velcro spots in a grid. There is a line of 4 across the front of the school, then a line of 3 interspaced between them a step back, then 4, then 3, you get the idea. Depending on the class size we line up on the 2s (everyone on the two middle spots doing back), the 3s, or 4s. Last night we not only lined up on the 4s, but people were then shuffled up to the 3s in between us. As a result, it was really crowded, but there was definitely more energy. b) put a fist in someone else's ear, so no large arm circles. I still pushed a little hard, and get a sweat going. He had the regular adult students demonstrate some things, and that helped. One strange thing is that I couldn't do the squats. Normally those are a great exercise, straining the legs and getting them tired. But if I went down more than about 3-4", my ankle was strained. I'd noticed that Wed night, so I just bent my knees in time wiht everyone, but didn't really go down, so no real effort involved. At the end of the night when I was doing them in front of Delaney he was pointing at me and telling me I wasn't working hard. He was right! After a good warmup, we split into partners, but we did parent/kid partners, so I had Delaney. Just a few basic jab/cross items, but it was fun for the other parents to see what their kids did. Quite a few were tired and I think they have new appreciation. It was also neat to see the little 5 or 6 yr old girl next to me with her Mom. She was so serious, and I'm sure her Mom loved it. The last part of class had the parents separated from the kids into two lines. There was a big space between us and Shihan brought out his new "cube, " a foam cube about 2ft square with differnent things printed on each side. One says "Pushups", another "squats", there's "tell-a-joke", and "teacher does 25" along with a couple others. He had a kid roll and then an adult, with the result being the other side had to "do" the thing. A kid rolled first and the adults had to then to "crunches." Kids got stuck with "squats" and we went back and forth. It seemed the adults constantly ended up doing crunches, which was good for me. The count was 20, but I did 30-40 of each, depending on time. The kids got away with a joke and a teacher effort for a few of their rolls. All in all it was a fun time, everyone laughing, breathing hard, and I'm sure having a good appreciation for what their kids do. Shihan ended with a special for 2 months, $99 instead of the $75 that it normally costs. Delaney pays $100 in the leadership class, me $75, and that's a lot. It's comparable to health clubs for adults, but a little more expensive. I'd argue more motivating, but not for everyone, and time is limited. And if you've got a kid, then you're $150-175 a month in the hole. I can see why not that many adults are in there. A few have said that. I'm not sure what a good price is, but I'd go for less $$ and more people. Delaney wants Tia to go, and asked me if I could get her to go next week. I said I doubted it, but the following week when he's back from summer camp, perhaps we'll have a family night. I asked Kendall if she would try and she declined. I went to make coffee this morning after spending some lazy time in bed. No school for Kendall today, so I didn't have to wake her up. I woke at 7:30, was worried we'd be late for a second, and then I remembered, so I reached over, grabbed the laptop, and started scanning things for the day. I meant to buy some at Wal-Mart yesterday, and forgot as well. I needed a list and didn't make one, so I ended up with no coffee and no TP. We're low on that as well, coincidence? I managed to find a new bag of Starbucks middle East-Roast-something or other, but it was caffeinated. I have a decent amount of caffeine in my diet, so I'm not overly worried, but still it's not something that I normally do early, so I'm being careful with two cups. Still need to run. I study karate on a regular basis, and over the years I've practiced a number of different martial arts, most of them in fairly strict in the traditions and routines of student behavior. When I started this new school with me son, it was a lot less strict. That was OK with me, I'm older, and it was a new business with a fellow IT worker leaving his job to pursue his dream of a martial arts school. Old habits die hard, and I was used to bowing before I moved, before/after kata, and at other times, without exception. Most people in the school only bowed when asked (begining or the end of class, when the teacher mentioned it at the start of kata, before partner drills, etc.) However I bowed every time before I moved to change position, line up, keeping with the routine that had been drilled into me at many places. After about a year, most people were doing the same thing. Our teacher had noticed, and actually called it out one day. I hadn’t really noticed the others since it wasn't something I cared about. I study for myself, and I've tried to pass that belief on to my son. Our instructor did say that I set an example, and he appreciated that. By living the way I thought was proper, I’d influenced people. I'm not sure what I take from that, but it did make me realize that our actions change change lives, even passively. I had to run a couple errands today, so I grabbed a new router while I was out. I've been dragging getting one with Tia out of town, but I can't switch machines since I need to be able to see both machines to move stuff from one to the other. So my plan has been to move the old one over to a wireless connection and have a wired connection for the new one. However our router can't handle the wired connections anymore, so I can't do that. It's home, and I'm ready to set it up, but I don't know the password for the DSL account, so I'm stuck. I sent Tia a note, but I bet I'll end up calling Qwest to reset the password. A long term test in Europe released some results recently. A series of Mercedes-Benz trucks, buses, and heavy-duty vehicles ran a sustainable diesel produced from palm oil for a year. They had reduced emissions, not just from the tailpipe, but calculated back through the lifecycle of the fuel. That is a nice step forward, and it’s good to see someone announcing results from a pilot, and not just from research that they hope to deploy. Too often it seems that companies announce a new product without having done long term testing of it. I don’t know if this is a better idea than other fuels, and where else palm oil is used. One concern is that we take resources from other areas that need them, like removing corn from the food system for ethanol, but a renewable diesel would be nice. It would be good to also know what the impact on the engines was in using this. I know the vegetable oil is supposed to work fine in diesel engines with minor modification for keeping the oil warm, but does it gum up? Cause more maintenance or reduce engine life? These types of things should be investigated, and it this works, the pilot expanded to other areas/climates. It’s a quiet morning, more so than usual. Delaney stayed up late last night playing games, and I let him. He’s growing up, it’s summer, so he got to stay up. Kyle’s on his usual schedule of sleeping in late, and with trash out, it’s just quiet here in the house. Good for getting a few things done. Need to go get some podcasts done before everyone wakes up. While I was in Pensacola last weekend, I sat next to Andy Warren and I was telling him about getting my son, ,Delaney a knife for Boy Scouts. My son had earned his Totin' Chip card and was excited to be able to carry one, so I looked on Amazon and got him one. Andy asked me what kind, and I said "blue," which apparently doesn't qualify as a kind of knife. Andy then showed me his knife, which is nice, it's sharp, it has about a 4" blade on it and it's made from carbon fiber, or so he told me. I said I'd gotten a similar one from Amazon for Delaney, but he was only allowed a 2 1/2" blade, so it was smaller and blue, but the same type of folding knife you see so many people carrying. Then Andy told me he'd paid $200 for this knife. I have to admit I was shocked. $200 for a knife you carry in your pocket? Seemed like a lot to me. I'd gotten Tia a Skeletool for Christmas, which has a number of things along with a knife that she carries when riding. But it wasn't $200, and I'm not sure I could get $200 out of a knife. Heck, I'm not sure I need one. But Andy's a tool guy, and I can respect someone that gets what they want. He told me that a knife is handy, and just on the trip up he'd bought a DVD, used his knife to quickly and easily slit it open, no messing with the plastic sealer on the end of it. No effort for him. I have noticed the last few months that there have been a few cases where I could have used a knife, so maybe I'll pick one up for myself. It won't be carbon fiber, however, and definitely not $200. After a week and a half layoff, I went back tonight. I was thinking we'd do sticks since we haven't in a few weeks, and that shouldn't be hard on my ankle. Instead we did a few kata and then spent time learning the shodan I kata. I took it easy, shorter stances, but there were a few places where we held a position and it made things sore. Back in bed with ice. I'm feeling better today. Yesterday was the first day that my ankle really didn't hurt while running. It is even better today, with me going through the whole 1.5mi at 6.2mph, but it's slightly sore. I'm tempted to ice it, can't decide if that's good with karate tonight. Yes, I plan on going, and taking it easy, after missing almost two weeks. I hope this isn't real, but I suspect it is. If this image disappears, I promise not to sue. I got my results from Karla Remail on the SQLSaturday talk over the weekend. I was surprised since typically other events have taken a few weeks to get results. I am not sure if this is the SQLSaturday platform or Karla’s diligence, but it’s welcome. Quite a few speakers were heading up to SQLTeach in Toronto this week, so it’s good that they got feedback quickly. I would appreciate PASS doing this, making it a priority (or automating it) so that we could easily get quick feedback while the presentation is fresh in our minds. I stumbled on a couple things, and I had a few notes of things I’d change while I was talking. I wrote them down, and since I got immediate feedback, I can decide now what to change for next time. To me this means that I stumbled a bit and I have a few improvements to make. I ran over the presentation quickly on Fri, but not enough since I’d forgotten a few things on my slides. The delivery wasn’t as good as I’d like, and I need to fix a few things before the end of the month when I do this in Richmond. Good advice from Mark Cuban on getting going in 2009. Worth a read for those early in their careers, but applicable to everyone as well. Apparently Piper and Sparky are like brothers. They both came back on our trip to Pensacola and they like each other. Sparky really likes to swim more than Piper, but Piper, the smaller Boston Terrier is stronger than Sparky the something or other. Kendall says Sparky is a collie, and he doesn't get along with George, the German Shepard. They couldn't ride back together in Kendall's bag. However Rescue is going to be in charge of them all since tomorrow his his birthday. Rescue will be 17, and Sparky is only 15, but perhaps Kendall mis-calculated (her word). She thinks Sparky is 16, but that could be wrong. George is 16 as well, and he's second in command of everyone. Bob, who is half Kendall's size, and just had to come on our trip, is still in the suitcase, apparently forgotten about. White Fang, who had to ride in her backpack, despite his large size, is still there, not apparently allowed on the bed. Buddy, the Guinea Pig doesn't like any of them. We had an early meeting for Scout summer camp today and heard about all the things we need to do to get ready. It's not Delaney's first time away from home, so I'm not worried about him, but I do want him prepared. It's been 6 years since Kyle went, and there are a few things that have changed and that we need to get. He couldn't find his scout book before we left, which is a big deal. He has a lot of sign-offs in there, and we don't have copies, so we'll need to have him do those again if he can't find his book. I helped him look a bit, but he's cleaning his room to try and find it before Sunday. If he doesn't have it, then I'm not sure what we'll do. He did turn in his first merit badge card completed, and that's a nice step. He had to walk around, get told to get the Scoutmaster signature, then get told to fill out his name and date, get the signature, and then turn it in. Hopefully he learned a few things and he's motivated to work on others. He has two in progress and 3 more to work on at summer camp. It's a balance, trying to keep him motivated and on track, but not push him too hard. Mostly I remind him, which is more than some Dads, less than others, and then have him do the work. I hope he enjoys it, and I think he will. It should be a good experience for him. My baseball team won this past Sunday, with me being out of town. Maybe that's a sign? After my 0-3 batting performance, perhaps it is. I get a short summary and an update every week of stats and how we're doing. I was wondering with so many people getting hurt the week before, but it turned out OK, and we picked up a new pitcher, which is good. Looking forward to playing this weekend, and need to get some cage time. I got quite the mention from Robert Cain over at ArcaneCode in a blog recently. He listed me as a "Big Thinker" along with some pretty amazing company. Kim Tripp, Paul Randal, Alan Stevens, and others that are prominent in the tech community. I'm sure more are coming, and it's an interesting take. A busy day here at the ranch. At least it looks like rain so I won’t feel bad if I don’t cut any grass. Missing yesterday jammed me up. I worked for awhile last night and was tired, I gave up, watched some TV, or tried, and then woke up around 12:30 with the laptop on my chest and the TV on. Delaney didn't want to hit karate tonight when I picked him up. He gave me the "I'm tired after my weekend" story. Normally I'd believe that, but the parents that kept him last night said the boys went to bed early, exhausted from camping. So I made him go. He wanted to do the adult class with me, but after explaining to him 4 times that I had to pick up Kendall and couldn't do class, he relented and went in there. I watched a bit of him doing self-defense and then went to get Kendall, not returning until the end of his class. When he came off the mat, he was smiling, a big grin on his face, and wanted me to see how sweaty he was, working hard. He rarely comes off so jolly, so I knew he had a good class. When queried if he was glad he went, he said "yeah, it was good" with a big smile on there. Good to see my boy likes working hard, and enjoys the feeling. When he got in the car, I realized he inherited something else. He's a sweaty, stinky mess after a workout like that, earning him a shower tonight. I told him he was probably close to needing a shower every day, which didn't thrill him. Not sure why he doesn't want to shower, but this will likely be something to remind him about for some time to come. We're in Denver and it feels good to me home. I kept asking Kendall if she liked Pensacola, and she did, but she said she likes Denver and doesn't want to move. Interesting to hear that from a water girl. Things were uneventful. We woke up, got the shuttle to the airport, which seemed silly since the airport was like 3 city blocks from the hotel. If I had walked to the corner of the block where our hotel was, about 20 yards from the front entrance, I could see the terminal about 1/2 mile or so away. It took like 3 minutes for the driver to get us there, waiting at the light to move. We checked in, waited our hour for the flight to arrive. Kendall wanted to buy something, of course, and kept walking to the shop nearby and coming back asking for things. I told her that she had enough stuff and she could find a container for her sea shells in Denver. She eventually wore me down to get her one "amazing" seashell for sale in the store. I told her it had to cost < $5, and she found the perfect one, wrapped it in tissue paper, and checked on it a few times during the flight home. We landed in Atlanta, ate at Moes, and then sat for our flight. I read on the Kindle, Kendall played on her DS and listened to her iPod. It was a long, but uneventful flight. Kendall amused herself and let me read. I should have worked a bit, but I was cramped in a middle seat, and I was sure she'd want me to do something with her if I pulled out the laptop. Or she'd want to watch a movie. I lost my laptop most of the weekend so she could do that in FL already. It was good to get home, but we were then racing around. Racing to get home and switch cars. Racing to pick up Delaney. Racing to tutoring, it was something else. I didn't even get to run until 8:30 when we got home from running kid errands. Tornados in Colorado. Scary. Southlands is about 10 miles North of us. We'll see the damage when we get home this afternoon. It was 4:01pm when I noticed. Doh! A huge Doh! with Tia already out of town and Delaney with friends until, supposedly 8:00 tonight. So I called Continental, and the earliest they had was a 3:00 flight tomorrow. We decided to head to the airport, turned in the car, thinking there was a 6:00 we could stand by on. We get there and check, and we'd stand by in Houston as well, not a good plan. They didn't even have anything tomorrow, and would reprice us for $300 if we made the 3:00 tomorrow, but couldn't confirm us until 9:00am Tues. Not good. No one else had anything today, but Air Tran wasn't on their system, so I walked over there. They couldn't get us out tonight, but they had a 6:20 and an 8:56am, both for $230 one way, so I just booked those. Now I need to get Delaney and horses covered.